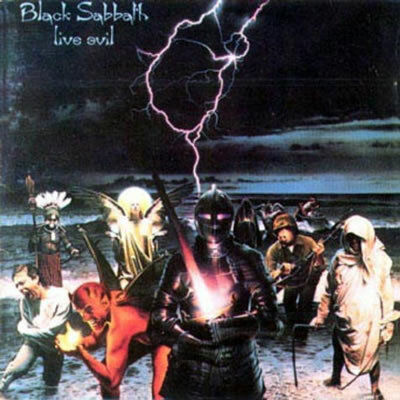 This first authorized Black Sabbath live album came pretty late in the band's career but at least it definitely had a great performance to back it up! Even though Black Sabbath doesn't show that excellence of Deep Purple's live performance captured on Made In Japan, they undertake the ambitious task of creating a set-list that would please the fans of both the past and present. Of course, most of the Ozzy-era material is taken from the hit album Paranoid while only one track is picked from both the debut album and Master Of Reality. Otherwise we get a show filled with all the hits from Heaven and Hell and only a about half of the best material from Mob Rules where even The Sign Of The Southern Cross gets partially substituted for a continuation of the Heaven & Hell jam. There aren't any real surprises on this set-list which clearly means that Sabbath weren't taking any chances when compiling this first live album. I, for once, would have loved to hear Iron Man being replaced by an extended take of Falling Off The Edge Of The World, but something tells me that I'm in a minority here. To be perfectly frank, the Ozzy-era material just doesn't work with Dio's vocal style where he prolongs each syllable. Listening to him trying to catch up with the fast-pasted tempo of Paranoid is a really painful experience. I'm also not too keen on hearing Dio dumming down some of the songs by shouting out explanations to their lyrics. Just listen to War Pigs and you'll see what I mean. Thanks to the great dark atmosphere and pretty decent sound quality this release is still probably the best Sabbath-live release from the '70s and '80s, even though most fans would probably completely disagree with this statement. Tony Iommi really plays his heart out on most of these performances and he even goes a bit over the board right towards the end of Children Of The Grave, not to mention the freak out ending of Heaven & Hell! The is a great addition to any Hard Rock music collection and good, but non-essential addition for everyone else.